Access Control safety and security issues pertaining to staff, employees, pupils and students are as important as ever. 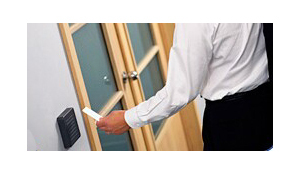 We can provide a swipe card access control solution tailored to the demands of modern security issues in today’s world. Your business and your employees need the best protection available. facetime can offer this in an affordable cost effective Access Control Solution that utilises the very latest Biometric fingerprint and Smart Card Technology giving you peace of mind that you are doing all you can to ensure your business premises and staff remain safe and secure at all timesAccess control solutions should be simple yet effective. The management of building access and door entry can at first seem complex no matter what size of your business. There are many things to consider for example what time do employees arrive and leave the building, how long do they stay on site, in the event of a fire or other emergency situation how do you find out who is on site. Visitors to the building also need to be controlled and you may wish to restrict access to various areas and monitor were they have been and for how long. Staff and visitors gain entry using either a key fob, contactless card or traditional swipe card. Entry can be restricted by entrance and when the card or key fob is presented. Reports will also give you a full record of personnel movements.Visitors can be pre-booked to aid in administration and lost cards can be blocked at the click of a mouse. 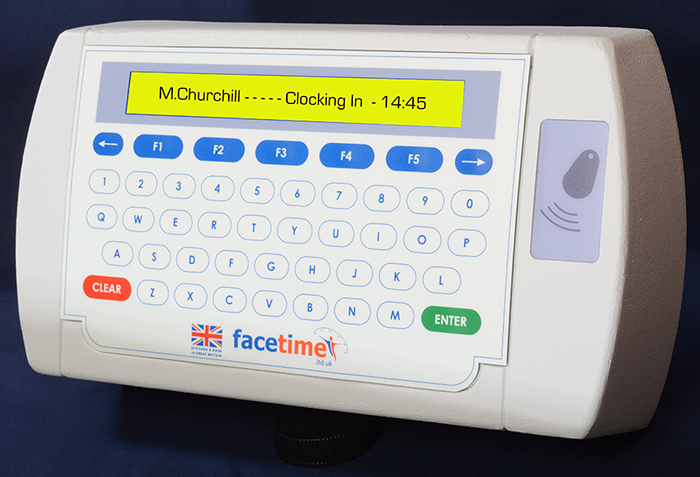 Our very popular FaceTime product is a “real time” IP addressable networked multi user access control T & A system, that will give the jurisdiction of monitoring staff and visitor access directly back to you. You can link your fire alarm panel directly to the access system for automatic fire roll call reporting to a dedicated printer and to the pc’s printer, ensuring that you conform to the current emergency fire regulations means you will stay within the law giving you peace of mind and a satisfaction that you are doing all you can to protect your employees. The on screen attendance display panel will give instant monitoring of who is in the building, this can be viewed from any number of pc’s. facetime offer Access Control software for realtime reporting and notification of any possible security breaches or threats, from single door to multiple doors, CCTV surveillance, visitor control, fire alarm links enabling a fire report to be automatically printed to any designated printer upon activation of your fire alarm. Falcon Pro can be connected to each door via tcp/ip address using your existing network structure. A safe and secure workplace improves moral, and provides a working enviroment that will allow individuals within your Company or School to perform better and more efficiently. Facetime can provide you with a card or biometric access control system, specifically suited to your requirements. Providing effective monitoring of employees,pupils and visitors entering and leaving your premises, allowing you to control where they can go and when, is an important factor in the planning and implementation of any workplace security strategy. Asset and data theft is on the increase, and you owe it to yourself to ensure as much as possible is done to protect your material and intellectual property. Our computer linked access control systems are mostly software driven, for example FaceTime access control door entry software with automatic fire roll call reporting , will link to your fire alarm panel, allowing FaceTime to automatically generate a fire report to any printer or remote location, on activation of your fire alarm. Individuals and visitors are allocated to a security group within the software, this controls movements throughout the building, each individual will be granted or denied access at any given door, according to their assigned security group. FaceTime integrates with a wide range of id card readers,using magnetic, bar code, proximity and biometric fingerprint technologies, we can control most types of electronic releases/locks, barriers or turnstiles. 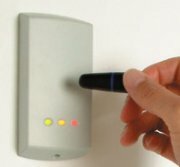 We also have a range of access control equipment that works independently, and does not require a computer connection. This stand alone capability is very useful where a computer connection is not practical or possible. The Bewator K42, K12 and K44 Duo range of codelocks are suitable for internal or external use, no more need to issue keys and the associated risks of theft,copying or simply misplacing them and having the costly exercise of replacing door locks. Bewator products are always of high quality and are ideal for nursing homes, hospitals, schools, offices or any type of commercial or residential premises where security and access control is important. The Bewator K12 is for single doors and has an alarm bypass function. Their are two relays, one controls the door the other is for control of the alarm. The Bewator K12 is suitable for external or internal use. The keypad is backlit for poor lighting conditions. The Bewator K12 comes with 4 code combinations, 30 codes are available in advanced mode. The Bewator K44 Duo features a door bell and a duress ability enabling a silent alarm to be sent requesting help, when a number 1 is added to the last digit in the access code. 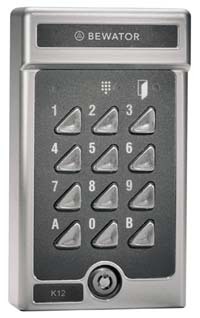 The Bewator K44 Duo is expandable to 30 codes. It has backlit keypad and all the features of the Bewator K42 and Bewator K12. The Paxton Access Cardlock Compact Readers in satin chrome or black finish, is manufactured for interior or exterior use and has a 5 year warranty, and accommodates 10,000 users and 3 zones. Magnetic swipe cards are available in Red, Green or Amber, the colour of card signifies the access zone. Lost cards can be deleted by swiping the duplicate shadow card through the reader. The Paxton Access Proximity P Series Compact Readers use proximity cards or key fobs instead of mag swipe cards, and have a read range of up to 70mm. The Proximity P compact readers come in 3 sizes. This is a very user friendly and easy to use stand alone access control reader. 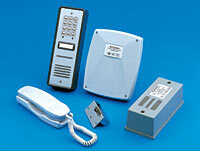 Programming of the proximity P series readers is done via the function card pack supplied with each kit. Users can be deleted from the system by presenting the shadow key fob to the reader, this enables you to remove users from the readers memory in the event they are barred, have lost their key fob or suspect that it may have been stolen. Both the Paxton Access cardlock compact readers and the Paxton Access proximity P series are manufactured to the highest standards that paxton are renowned for, and will give years of trouble free service. The Bell System coded access control kits CS106 & CS109 are ideal were there is a requirement for reliable door entry security, along with the need for a pin code solution for access control, as opposed to a swipe card. 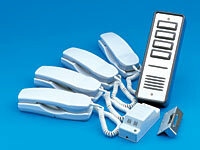 The Bell System 900 series audio door kit includes the bell model 801 telephone handset, Bell SPA front door panel, Bell model 61 speech unit, the model 203 lock and Bell 212 12V AC PSU. The Bell System model 904 is displayed in the picture on the right. Bell Systems are a UK Company who have been designing and manufacturing door entry access control equipment for 30 years, and have achieved a enviable reputation for quality and very good after sales support. 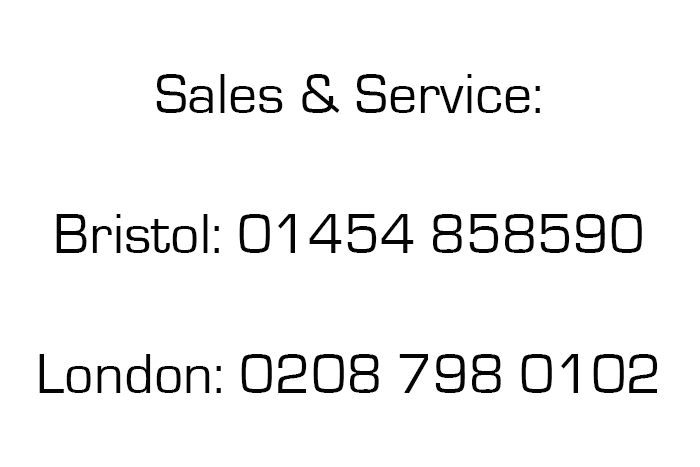 We are happy to quote for any Bell Systems equipment, just call our Bristol office on 01454 858590 or our London office on 0208 938 3394. The biometric technology used in our access control fingerprint readers has been chosen very carefully to ensure accurate identification at fast reading speeds. Biometrics is a relatively new industry with lots of systems that are either unproven or simply unreliable. 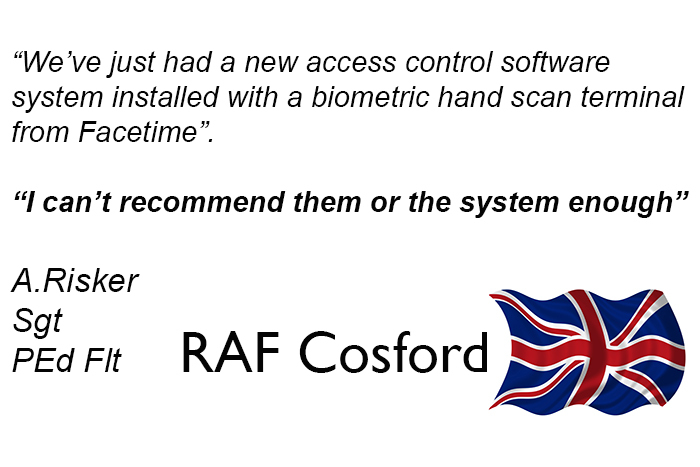 You can rest assured that our biometric readers when used in conjunction with the falcon access control software, will give you unrivaled reliability, protection and peace of mind. Biometric access control is not a hi-tech vision of the future, it’s a technology available now and is proving to be an affordable cutting edge solution to security problems faced by all business’s in todays city’s and rural areas. 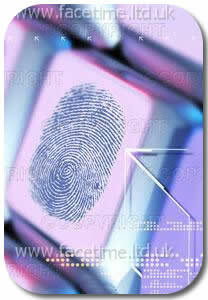 Biometric access control offers you the indisputable identification of employees and personnel. This simply means a safer and more productive working enviroment for your visitors and staff. Our biometric readers utilise the fingerprint which we believe to be the most trustworthy and accurate means of ensuring people identification for access control purposes. The PrintX and PrintXS are the latest and most accurate biometric readers available for access control. Smart Cards and Biometric Fingerprint Data – To safeguard the personal privacy of your employee’s fingerprint template, it is now possible to store the fingerprint data on a smart card. The biometric fingerprint template data is stored on the smart card’s data chip, when the employee places their finger on the biometric reader, the scanned fingerprint is compared with the stored information in the smart card’s data chip. This solution should remove any apprehension employees may have regarding privacy issues. We supply smart cards using the Mifare ® 13.53 MHz technology from Philips, this system offers speedy communication and allows encrypted reading and writing. This technology also means that the smart cards cannot be forged; they are very durable and normally last up to 10 years.